This report is a companion to the Transition to Practice Report. This is a comprehensive report of all the evidence identified by the Transition to Practice Committee that is relevant to a regulatory transition model. 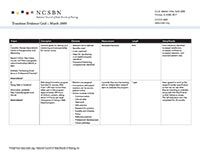 This report was adopted by the May, 2008 NCSBN Board of Directors.